Trans activist Reina Gossett accuses out filmmaker David France of stealing her work to make his film about the Stonewall icon. But there's more than scandal beneath the surface. 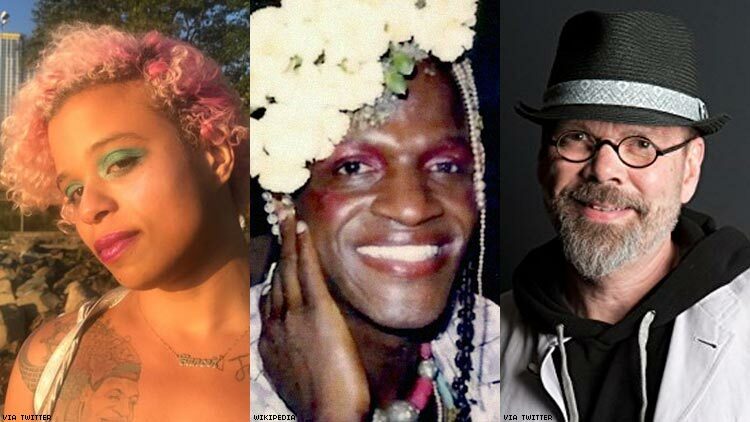 Several months after the eruption of an entertainment industry scandal that rocked the LGBT community and pitted a trans woman filmmaker against an Oscar-nominated queer cisgender man, three chief questions remain: Who first developed the idea for a documentary about Stonewall icon Marsha P. Johnson? What, if anything, was stolen to create it? And who has the right to tell these stories anyway? Top billing goes to David France — the out journalist turned filmmaker known for the Oscar-nominated ACT UP documentary How to Survive a Plague. His latest production, The Death and Life of Marsha P. Johnson, which was released on Netflix, positions him as a champion of the transgender community. France — a white cisgender queer man — has said he was a longtime friend of the late LGBT legend and veteran of the Stonewall Inn uprising. His antagonist in this real-life drama is activist, writer, and budding filmmaker Reina Gossett, a trans woman of color who identifies as queer. Gossett worked as a community organizer and ultimately membership director at the Sylvia Rivera Law Project and in 2013 was awarded the Barnard Center for Research on Women Activist Fellowship for her work at the intersections of trans justice and prison abolition. After years of research on her own time and dime, she decided to tell Johnson’s story through her own lens and teamed up with filmmaker Sasha Wortzel — who is queer, white, and cisgender — to co-direct a short about Johnson, Happy Birthday, Marsha! due out this year. Gossett alleged in an commentary for Teen Vogue that France made his latest documentary, which has received critical and community acclaim, by capitalizing on her research and ideas — a claim that France disputes. What Gossett alleges in those comments isn’t about theft per se, but about privilege and who ought to be telling the story of Johnson. But that question has been mixed up in public debate about whether France actually stole footage from the trans filmmaker and her partner. Although her claim first made headlines following her commentary, Gossett didn’t just pop out of the shadows to claim credit; she leveled her first accusation against France in April when his documentary premiered. “David,” she tweeted April 19, “you literally mined my work for your film, best believe your film only exists because I put that video online," referring to four clips of archival footage of Johnson she posted to Vimeo and Tumblr. David you literally mined my work for your film, best believe your film only exists because I put that video online. Randy is Randolfe Wicker, a New York City gay rights activist, pioneer, and Johnson’s roommate, who in August talked to Out magazine about Johnson. He not only lent his videos to Gossett and Wortzel but also participated in interviews with them at the beginning of their research. Wicker confirmed these details to The Advocate and that he licensed France to use that footage as well for close to $17,000. During a Q&A in November following a screening at Emerson College in Boston that was part of a community outreach campaign of screenings across the nation, France said a total of two minutes and 28 seconds of his one-hour, 48-minute film consists of footage that also exists on Gossett's Vimeo page, but he told students his team gathered that footage from their own original sources. He denies that any of it was used improperly. That last scene is from the Christopher Street Liberation Day rally, which was seen in Arthur Dong’s The Question of Equality: Out Rage ’69, which debuted on PBS in 1995 and has appeared elsewhere. If this disagreement were merely about use of video, then that rally footage, plus three clips of Johnson and Rivera, are the sections in dispute. Gossett admitted in a tweet in April that she did not obtain the legal rights to share the video of the Christopher Street Liberation Day rally. Gossett’s tweet was in response to Vimeo’s removal of the video after one of the copyright holders, the Lesbians Organized for Video Experience (LOVE) Collective, asked for it to be taken down, citing copyright infringement. France flatly denied playing any role in that decision, as Gossett charged. “I had nothing to do with that, and LOVE said the same thing. It was Reina who said she was stealing these tapes from the license holders to free trans history,” said France. France said he is especially frustrated by that accusation. “I stole Reina's labor? What labor? What are the details?” he wrote in an email. When asked to specifically answer that and other questions, neither Wortzel nor Gossett responded via email and since October have declined to be interviewed further by The Advocate in person or by phone. France provided detailed emails, text messages, documents, screenshots, and photographs as evidence that the research he and archival producer Mark Blane and their assistants did to cull hundreds of hours of film and video went beyond a review of Gossett’s online archive. They scoured thousands of files housed in the New York Public Library, and sought out private collections and witnesses to history to assemble a digital archive of 1,100 clips. France provided The Advocate with documentation showing he licensed the original footage of the 1973 rally shot by cinematographer Tracy Fitz and then went one better, saying only a small portion of the footage was used because his crew sourced alternatives. The France team can produce licenses for the copyright on all three of the remaining clips in dispute. Lead producer L.A. Teodosio told The Advocate that’s because the team collected 270 hours of footage from 60 sources to make France’s film and kept digital records to credit the owners and license holders for their material. But France insists he didn’t see a reason to credit Gossett. "You credit raw material when it's the people who own the raw material or the people who license the raw material or who shot the raw material,” he said. “It's all about gathering up all the raw material." France did concede one point: In making her film, Gossett obtained one film source that no one other than New York University film students had seen in public until she exhibited it in November 2015 at Cooper Union in New York. “While we were editing the film, journalist Diana Tourjée connected us with Darrell Wilson, a film professor at NYU,” said Gossett and Wortzel in their joint statement. “He had footage of Marsha that he and his friend had shot in his basement in 1991, and he wanted to share it with us because of the work we were doing. This footage had never been made available to the public. After watching this beautiful document in a dark room together, he donated the footage to us, and we began integrating it into our narrative film. The footage is interwoven throughout.” Tourjée confirmed to The Advocate the events occurred as Gossett described. France admits he was in attendance at the 2015 event, that he thereafter obtained and licensed a second-generation copy of that same film, and inserted a clip that he says amounted to 14 seconds of his film. Although France said he was aware Wilson’s material existed prior to the showing, the fact that his film uses this video after he saw it for the first time during Gossett’s presentation supports her claim that "Clearly France has seen and learned from our work." But instead of giving up, the pair nevertheless persisted. As Jezebel noted, Johnson did not describe herself using the word “transgender,” a term that Rivera embraced before her death in 2002. Johnson identified as a gay drag queen and used the word “transvestite” instead. Happy Birthday, Marsha! will star Mya Taylor (Tangerine) as Johnson and Eve Lindley (Mr. Robot) as political firebrand Sylvia Rivera, a friend of Johnson's. In contrast, France’s film focuses not on those women but on activist Victoria Cruz, formerly the senior counselor for the New York City Anti-Violence Project. It’s her mission to connect the past violence faced by transgender women of color with the modern-day epidemic of murder and to try to determine how Johnson died. The official police report from 1992 is that she killed herself, but friends and advocates suspected foul play. Police reopened the case and changed the cause of death from suicide to “undetermined” in the early '90s. But how is one to determine whether the video Gossett posted was “stolen” by France? One thing is certain: There isn’t a lot to choose from. Even Entertainment Weekly’s review complained there wasn’t nearly enough Marsha in France’s film. Careful and repeated screenings of France’s film on Netflix back up what he, editor Tyler Walk, and archival producer Mark Blane have said in individual interviews: that nothing in The Death and Life of Marsha P. Johnson appeared in the same sequence as posted in Gossett’s collection on Vimeo. But because so little archival video exists to go around, there can be no denying that to the casual viewer, some of the same images and clips of Johnson and Rivera that Gossett collected online, whether legal or permitted, do appear in France’s film. His clips are of better quality, as they are from different sources, and all come with permission from the copyright holders. But to Gossett and her supporters, that’s beside the point. France’s defense is always that his film uses footage that was obtained from sources other than Gossett’s online collection, and included with the permission of those who own or license those clips. With the exception of the Wilson film and a tribute video by filmmaker Tara Mateik, France and team says every archival clip comes exclusively from original sources or owners, unlike the Vimeo archive. France also claimed on Twitter that Gossett’s short film "exists in concert," since his work is a documentary and hers is a narrative — even though that’s not how it started. Gosset, Wortzel, and France all originally set out to make a documentary. For a short time in 2013 into early 2014, France claims, the three of them were actually collaborating, a statement neither Wortzel nor Gossett would confirm but France’s producer backs up. “I reached out to them because I figured we were working on similar projects, and we determined there was no overlap,” said Joy Tomchin. University of Arizona professor Susan Stryker, who knows Gossett and Wortzel and served on France’s film advisory panel, confirmed that the women believed there would be no overlap in a Facebook post in October — and Stryker also expressed deep regret not to have realized a “peaceful coexistence” of the projects had ended after she received this note. Conlon said she was never introduced to France's funders, and Gossett and Wortzel also dispute the “we” part of France’s statement. They say the $5,000 in startup funding came not from him but from his producer, Tomchin. Tomchin confirmed money changed hands and said Gossett and Wortzel were the ones who were uncooperative. “I gave them $5,000 when they started and asked them if they would work with us and do a film together and they declined, which I understand. That's fine,” she said. Tomchin, who said she identifies as a "very butch" lesbian, stood by France and called Gossett’s allegations "absolutely false." Gossett and Wortzel confirmed they never in the process of early conversations gave any footage directly to France or his team. But it’s still not true that France hadn’t seen any of the footage “until later,” since he had seen one clip at the presentation at Cooper Union in New York City in November 2015. But what if France and his team were to reproduce almost exactly the footage Gossett curated for her own project, even if their efforts were to find a cleaner and more legally appropriate version of the same scenes? Wouldn’t Gossett be within her rights to complain she got ripped off? Does the question of ownership necessarily supersede the value of individual art to celebrate the disenfranchised? Gossett and Wortzel may not be Robin Hood, but they certainly do fit the “rob from the rich” model as they have painted France, fairly or not, as a cisgender sheriff of Nottingham. In their statement posted online, they argued that "from the moment [France] learned about our efforts, he engaged in a repeated pattern of behavior in which he followed our labor, swooped in with money and resources, and also badgered people to acquire materials we had worked with so as to include those materials in his film." In spring of 2012, the Ira Sachs Queer Art Mentorship program paired Gossett and Wortzel with trans filmmaker Kimberly Reed to work on their documentary about Johnson, Rivera and the group they cofounded, Street Transvestite Action Revolutionaries. STAR provided housing and resources to low-income trans and gender-nonconforming people. Two years later, France hired Reed as a producer of his film. This fact is not in dispute. Reed and Sachs did not respond to requests for comment. In December 2016, City University of New York professor Tara Mateik responded to one of 26 emails sent by France requesting to use his Sylvia Rivera tribute video, Fenced Out. Mateik posted his response on Facebook, explaining that community members who he collaborated with had rejected the request over concerns about how it would be used and because of potential conflict with a competing project — which was likely the film by Gossett and Wortzel. Despite the refusal, France used Mateik’s film anyway, citing advice from his attorney that it constituted “fair use” under the U.S. Copyright Act, which allows short clips from television to appear in media and elsewhere if they’re being directly reported on. France’s film uses dozens of clips that his attorney determined were “fair use.” Like much of what Gossett collected, Mateik’s video is posted on Randy Wicker’s YouTube channel. In May 2013, Gossett and Wortzel entered their project in a competition run by Kalamazoo College and the Arcus Center for Social Justice. Both the filmmakers and France agree that France first learned about Gossett and Wortzel’s project during a visit with Jaime Grant, then executive director of the Arcus program at the school. But the details of this conversation differ about what Grant told Gossett and Wortzel, and what she told France. Grant confirmed only that France had been told about the other film and that France had been urged to support it instead of pursuing his own. France insists he never meant to imply that he alone was “the right person” to make this documentary, only that the story needed someone to tell it. “I think many people are the ones to tell her story,” he said. In a statement, a spokesperson for Arcus clarified that the women had entered into a competition to win a prize, not a grant, as Gossett first said on Instagram, and that no one currently working there could confirm whether France had seen their video. France maintains that he did not see even a frame of Gossett and Wortzel’s project at Kalamazoo in 2013, and he provided text messages from Grant that he says confirm it. He says the texts were sent as Gossett and Wortzel’s film was out for review for the prize (which they did not win). Although France claimed Grant gave him permission to share these messages, The Advocate reached out to Grant’s press representative to confirm their authenticity and was unable to get a response by press time. In the text exchange provided by France, Grant appears to confirm that France had the idea for a film about Johnson prior to learning about Gossett and Wortzel’s concept. Then in a separate text message to France, Grant appears to reiterate the point made in her statement to The Advocate, that her focus was on a bigger issue. Of course, on the internet, things gets thrown every which way. In addition to transphobic and misogynist attacks on Gossett and Wortzel across social media, both France and Blane were targeted by supporters of Gossett’s after transgender activists and journalists Ashlee Marie Preston and Janet Mock, among others, rose to the defense of Gossett and Wortzel. Blane, who shared a screenplay credit with France, says he first learned of Gossett when targeted as far back as July 2015: “Someone verbally attacked me at OutFest and told me, ‘You should be ashamed of yourself” for working on the documentary, because he and France are white and cisgender. “It scarred me and upset me. There are people of color and trans people who did the work and they are not being listened to, because people want the story to be about ‘a bad person,’” meaning France. The blowback from Gossett’s accusation of theft has cost France and his film considerable capital within the LGBT community, according to Alison Byrne Fields, the film’s director of outreach and engagement campaigns. Two-thirds of the organizations and institutions that originally agreed to screen The Death and Life of Marsha P. Johnson to raise money for LGBT and specifically trans-related causes withdrew their support, she said. The Berkeley Beacon reported the number as 90 out of 140. The backlash began immediately following Gossett’s Instagram post on October 6, just hours after Netflix debuted France’s documentary about the pioneering activist. “[France] ripped off decades of my archival research that i experienced so much violence to get,” she wrote. In response, France appears to be mounting an effort to rescue his latest film’s reputation as well as his own. France said he first met Johnson while on assignment for the Village Voice in 1982 when she took part in activism related to ACT UP. A decade later, Voice editor Richard Goldstein assigned him to write her obituary. “I drew the assignment to cover her death. I worked hard on that story, but my lover took ill and died — throwing me off my game, to say the least,” said France. Doug Gould passed away in November 1992 of AIDS-related pneumonia, just four months after Johnson’s body was found in the Hudson River. France said he’s been working on the Marsha project for a number of years — but it’s a little muddy as to how many. He told Gossett on Twitter in April that he began researching four years ago, and told Jezebel he had the concept for a film in 2009, but then later told The Advocate that the idea for the documentary crystallized in 2011. Both sides agree it was at Kalamazoo in 2013 that he learned he wasn’t alone in wanting to tell Johnson’s story. Gossett’s identity as a transgender woman of color made her an ideal candidate to seek justice for one of the movement’s most pivotal figures, and her project certainly benefited from its grassroots fundraising efforts. A 2014 Kickstarter campaign raised more than $26,000, and a 2015 Indiegogo campaign brought in $35,700. But even France concedes the deep pockets that funded his film came up empty when Gossett and Wortzel looked for their share of money. In addition to his Oscar nomination for How to Survive a Plague, France said it’s “beyond any question” that his white cisgender privilege was a factor in the vast dichotomy in fundraising. Underscoring that notion, Sundance awarded France the funding to develop his documentary, tapping a grant from Arcus in July 2014. Shortly afterward, Gossett said Wortzel got a call from someone who said they were working with him, asking if they’d share their contacts. This was more than six months after France claimed he had begun collaborating with the women and close to a year before his producer donated $5,000 to their project. This part of Gossett’s and Wortzel’s recollection can’t be confirmed because they don’t know the name of this employee and neither France nor his team are able to idenify the person. France said it is likely someone working for him did call the women, because they “turned over every stone” searching for archival footage. Beyond securing legal rights to the footage, however, there is still the question of who owns creative ideas. If Gossett is so convinced her work inspired France to make his movie, can she sue him? “For instance, if Shakespeare owned the copyright to Romeo and Juliet, would he have been able to sue Leonard Bernstein and Stephen Sondheim for writing West Side Story? Almost surely not.” So, to sue or not to sue? That’s not the question, in this case. Looking at this purely from the perspective of which filmmaker got a head start, the age of one puts them at an advantage over their rival. Gossett’s statement that she had been documenting Johnson’s life for more than a decade could lead one to conclude the 34-year-old has the upper hand. In our phone interview, 58-year-old France said he put his plan to tell his friend’s story in motion in 2011, when he and Tyler Walk were editing How to Survive a Plague. France’s focus since the scandal broke has been to repeat and elaborate upon those denials to several publications, including The Advocate. He has simultaneously launched an effort to promote Gossett’s own film about Johnson as well as to generate support for transgender and gender-nonconforming filmmakers, particularly trans women of color. Key to this mission are friends, colleagues, and financial supporters of France who have vouched for his ethics, his research, and the diversity of his team. “We all know that the trans community is the most embattled,” said nonprofit film distributor Jeffrey Winter, a gay white man who backed the film United in Anger. Winter is not associated with France’s latest project but came forward at France’s urging to defend him. Kamran Shahraray, a former archival coordinator who worked for three months in the summer of 2016 on the France film, released a public statement in October in support of Gossett’s allegations of theft. Shahraray wrote in an email to The Advocate that they were someone “who knows the archives better than anyone else.” They added, “Based on what I have seen, undoubtedly someone at some point made heavy usage of her work and research, and to say this didn’t happen is a bold-faced lie which flies in the face of all available evidence. If David would give you access to my email on their server as well as the intern account (which I worked off of for the first month or so in order to access files) I would be able to point to several instances where I brought up issues regarding missteps in their sourcing and research process. France responded, “We ‘did’ have to provide a narrative for each element in the film — in order to satisfy our insurer. This document is not for public consumption, and we would not post it publicly — it contains personal records and details.” France shared with The Advocate a copy of what he said was this document, known in the film industry as the Video Payment Edit Decision List, or EDL, to support his claim. It shows no mention of Gossett or Wortzel. France declined to make it available to readers, citing legal privacy reasons. In her response to Shahraray’s challenge, the lead producer, Teodosio, was the only member of France’s team to acknowledge that someone might have done more than just view Gossett’s video archive. Teodosio refers to the LOVE collection at the Lesbian Herstory Archives, which France said he moved from Brooklyn to Oakland for digitizing, paid for in part through a National Endowment for the Arts grant. To him, that effort will now allow other filmmakers to build upon his work and without fear of copyright infringement. But to Mock and other supporters of Gossett and Wortzel, France’s focus on defending his film and repelling accusations of theft are examples of tone-deafness, privilege, and the kind of verbal warfare Johnson and Rivera fought decades ago. “Though France may wish the unfolding story would focus on copyright laws and ownership to prove he did nothing wrong, ultimately we believe no one owns Marsha’s story,” Gossett and Wortzel said in their statement. “In fact the whole notion of someone owning Marsha is part of the same violent ideology our work seeks to challenge. This is not about owning people’s stories, histories, or about copyright/legal ownership. This is about the systems and individuals who profit off of the work of trans women of color, while we remain uncredited and erased. This is the very violence that Sylvia Rivera forced her way on stage to decry in 1973 at the Christopher Street Liberation Day. France denies he made a fortune off his film; in fact, he said it left him in debt. Since it didn't earn an Oscar nomination it’s unlikely to rake in more money than it cost — which is a lot more than Netflix paid to stream it. Regardless, the two sides seem far from a peace treaty. According to Byrne Fields, the free screening of France’s documentary at Emerson College in Boston on November 14 was supposed to be preceded by the trailer for Happy Birthday, Marsha!. Its creators were not pleased with the gesture and asked for the trailer to not be shown; the request was respected. "Members of my advisory board proposed that Reina and I meet with a mediator to discuss our different perspectives in the joyous spirit and example of Marsha P. Johnson. Unfortunately, she has declined,” he said in a statement in response to the demand for an apology. “I wish I could have assured her from the beginning that I didn't copy or steal or borrow from her work, but I accept that is how she perceives me and my film. I am sorry that in standing up for the originality of my work others have turned on her and demanded she apologize to me. That's not right. I'm not looking for anything except a chance to support what she's doing and to promote her work, and that of other trans filmmakers of color, on this and future projects." Correction: An earlier version of this story indicated the trailer for Happy Birthday Marsha! was shown at the Emerson College screening of France's film. While it was initially planned to be shown, Gossett and Wortzel asked for it to be pulled.